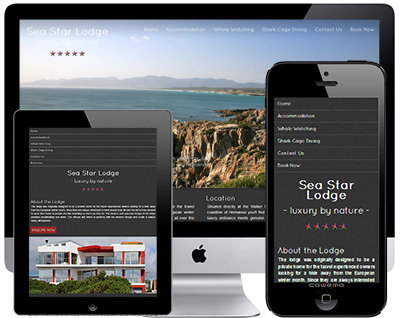 All ways to describe a website which is easily viewable on any screen, regardless of size. 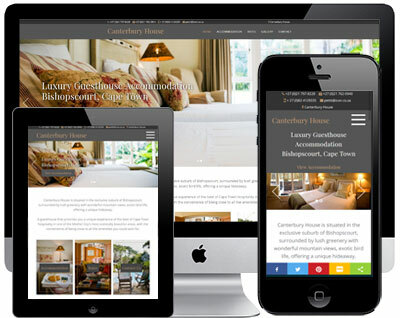 No matter what industry you're in, supplying a mobile website is no longer a questionable option, it’s a necessity! Consumers now expect to use their connected smart-phones and other types of mobile devices to take advantage of features through a mobile application. Consumers expect readily accessible and hassle-free browsing, and there is no question that a mobile website can provide a convenient way to provide support and customer service options, ecommerce oppotunities or just simply finding directions to your place of business. Creating a mobile website version for your business website will offer customers several different opportunities to remain satisfied. which is easily viewable on any screen size. Canterbury House is a luxury guesthouse situated in the exclusive suburb of Bishopscourt in Cape Town, surrounded by lush greenery with wonderful mountain views the guesthouse that promises you a unique experience of the best of Cape Town hospitality. The website was redesigned in late 2017 into a fully responisve design, complete with mobile-responisve social media sharing icons. The lodge was originally designed to be a private home for the travel experienced owners looking for a hide away from the European winter month. Since they are always interested to meet people from all over the world they decided to open their home to people who like travelling as much as they do. The modern and spacious design of the lodge provides breathtaking sea views. The African arts blend in perfectly with the modern design and create a unique luxury atmosphere. 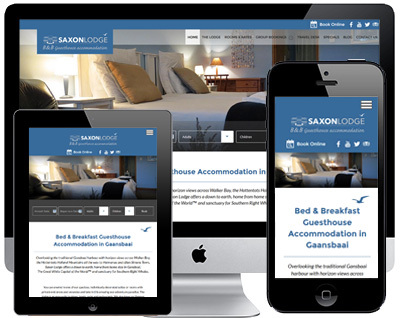 Saxon Lodge is situated in Gansbaai, the world's Great White Shark capital and arguably the best land and boat based whale watching region in the Western Cape. A short, beautiful, 2 hour drive from Cape Town and Cape Town International airport, 30 minutes from Hermanus and an hour from Cape L'Agulhas, the southern-most tip of Africa, makes Saxon Lodge a great central point for exploring the Cape Overberg and its natural bounty. Wine, Fynbos, indigenous forests, beaches, nature reserves, historically important caves to name but a few!